Tandem Kayaks are a great way to paddle in the great outdoors and experience nature the way it is supposed to be seen. Why do you need a tandem kayak though? Can’t you get a few single kayaks and go out on a nice family trip? You could but depending on how much space you have it may not be the most viable option, that’s where tandem kayaks come into the picture. In Terms of tandem kayaks these recreational kayak models are the perfect boats to get started in. There are many other different types of tandems such as tandem sea kayaks and tandem fishing kayaks but those are more activity specific and have a much steeper learning curve and are far more expensive. Think of these kayaks as a stepping stone should you want to get into those categories in the future. It’s not all sunshine and lollipops with these kayaks though. Often times these kayaks can be affectionately referred to as “divorce boats” because you need to be in sync with each other. If this does not describe your family take a look at our Best Kayaks page for a single seater kayak that better suits your family and your sanity. These tandem kayaks have a great durability to price ratio. That is you pay under $1000 and you get a quality kayak in the process that will last for years. Most of the time if you go under the price range of these particular kayaks you start sacrificing quality and paddle-ability (a word I just made up describing the kayak’s on water performance). These kayaks can also mix it up in a bunch of different conditions such as ocean bays, beaches, large lakes and class I rapids in River Conditions. In a way these tandem kayaks can grow with you as you gain more skill navigating and paddling them. When it comes to a tandem kayak which gives you high quality at a decent price, the Sun Dolphin Bali is an excellent choice. It can accommodate up to 3 people and is very comfortable for 2 people. The kayak has adjustable footrests which give you a lot of flexibility. Since there is an additional seat in the middle of the kayak for a 3rd person, the flexibility helps. The middle seat would be great for a child as compared to the other two seats it is small and is made of moulded plastic. One of the most common reasons people buy a tandem kayak is so that their family can join in the kayaking. When you have a child on board, you generally need more essentials then when it is just adults. That’s why you need a tandem kayak which has a lot of storage. Another great feature of the Sun Dolphin Bali is that it has great storage space. There are two storage hatches between the spaces for the user’s legs. There is an additional space in the middle of the kayak. It is small but you can store things easily in it. Best For: Great for small families, Good for paddlers who want a tandem kayak with lots of storage. Most of the customers online loved the tandem kayak. There are many comments about the steadiness of the kayak. People are very happy with the ample storage space. There are comments about leaking. The kayak has scupper holes which are used to drain water. Water comes in via these holes so you need to keep a waterproof container. There are drain plugs to drain the water. The tandem kayak from Advanced Elements is a very uniquely designed kayak. The kayak has three seats. You can either sit in the middle and paddle or two people at the front and back can paddle. This allows to you paddle alone or in tandem with another as per your wish. The kayak is very easy to carry and store as it is inflatable. You can also convert it from an open deck to a closed deck in literally seconds. The kayak is very steady which is not common in inflatable kayaks. You can stand on the kayak if you want to use it to board other boats or if you want to swap places. Since the kayak has an aluminum frame, it gives more rigidity to the kayak so the steadiness increases. Since the kayak is 15 foot long, there is a lot of space for all the three persons sitting in the kayak. The storage space of this kayak is really good. It has deck rigging so that you can store your gear easily. It also has a spray skirt that can be zipped. The kayak is very durable as it has three layers of high-quality material. This helps in ensuring that the kayak doesn’t get punctured or torn easily. Best for: Great for three full-grown adults. Good for people who need a flexible, inflatable kayak which is easy to transport. The reviews online are mostly positive. It is very easy to set up as requires about 1-2 psi pressure when it is fully inflated. It fills up very quickly. A lot of people commented on the stability of the kayak. People have slight issues when putting the kayak back into the case. There were a few comments about removing the kayak from the case and putting it back in. You need to keep half an hour spare for each activity. The Ocean Kayak Malibu is the smallest kayak we have reviewed so far. It is 12 feet long. If you have a small car and need a small tandem kayak so that you can transport it easily, this is the one for you. One advantage of having a smaller tandem kayak is that it is easier to maneuver in the water. It is a very flexible kayak. However, if you are tall or if you want to take the kayak out and there are three adults, this isn’t the kayak for you. One of the best features of the Ocean Malibu is that it has very comfortable seats and seat-backs, a feature similar in it’s cousin the Scrambler 11. It has wrap around seatbacks. This makes the journey very enjoyable and comfortable. It has a small third seat but it not very comfortable. It does not have any padding or backrest so even if your child can fit into it, they would be very uncomfortable. Best for: Long trips for two people as the seats are very comfortable. The kayak is very comfortable. You can easily go for long trips in it. You can use it solo or tandem. At 57 pounds it is not very heavy due to which you can manage it easily. It is very durable but the space in the kayak is not much. These kayaks are made for mostly having some fun in calmer waters. You can hit a bit of chop but they will be much more difficult to maneuver and paddle in those conditions. These kayaks are budget friendly but a bit limited in terms of performance. Conditions that these kayaks would be great for is calm waters, smaller lakes and slow moving rivers and bays. These are the ideal vessels for some family fun in the water like around the cabin or beach. They are also great for jumping in and out of the water or relaxing on the lake, just make sure you tie yourself down in case you fall asleep because the inflatable models tend to get carried on the water by the wind. 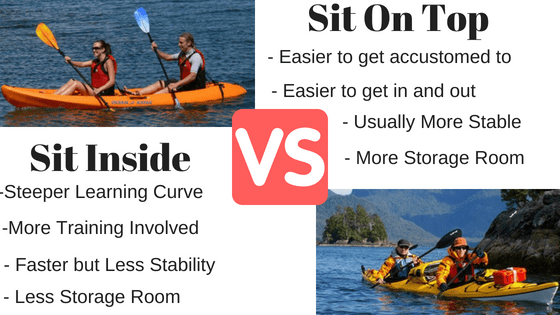 Though the Lifetime Tandem Kayak is not as affordable as the below two options since it comes in the sub hundreds category as compared to the other two in the sub hundred category, we have included this kayak as for its features, it is still the most affordable non-inflatable tandem kayak. The Lifetime Tandem Kayak tracks well in the water as it is a rigid tandem kayak. It is very easy to direct. It does not tip over in the water even though it is narrow and it is very stable when you compare it to inflatable tandem kayaks. It has a tunnel-shaped hull which gives the kayak more stability and helps in tracking. The kayak has soft backrests which are great for an ocean journey or other long distance kayaking. It also has many footrests which make it comfortable. One surprising issue is that the seats are not padded and after a while gets uncomfortable. Best for: A couple who want a rigid, non-inflatable tandem kayak at an affordable price. Most of the reviews online talk about its stability and ease of use. Though kayak has better tracking than inflatable kayaks, it is not as great in terms of direction when you compare it to higher-range models. It has great weight carrying capacity. The kayak doesn’t have much storage space and you can only accommodate two people comfortably as it is only 10 feet in length. The body shape of the kayak makes it difficult to strap it sideways on the roof of your car. The weight too makes it slightly difficult to load on to the top of your car. However, for its price, it is a very stable, good-quality tandem kayak. When it comes to an affordable, high-quality tandem kayak, it does not get better than the Intex Explorer K2. This is the only high-quality, branded tandem kayak which is less than $100 before discount. It is an inflatable tandem kayak so it is very easy to transport and is very compact. Since it is no very heavy at 33.5 pounds, it is also very easy to carry from your vehicle to the shore. The material used is high-quality vinyl and the kayak is very durable. The inflatable I-beam floor of the kayak keeps it steady along with keeping it comfortable. It still tends to be a bit unbalanced in the water in terms of direction. They provide a skeg that is removable so that you get additional stability in terms of direction. The kayak is comfortable as it has two seats which are adjustable and inflatable. It also has backrests for added comfort. Best for: Kayakers who want a kayak that can hold two people and are on a budget. Most customers say that it is excellent for recreational kayaking especially for a couple. You can enter it easily and since the seats are removable, you can face each other and relax and enjoy while gently drifting on the water. It is very easy to set up and very compact so even fits in a car’s trunk. The material used is good and it won’t tear or puncture easily. It wobbles in the water and is not great for tall people. When it comes to price, the Intex Challenger K2 is generally more expensive and is in the $200/- range, however, you get excellent discounts on Amazon which, if you are lucky will bring it down to the sub hundred range. The main advantage of the Intex Challenger K2 over the Intex Explorer K2 is that it is 11 feet, 6 inches as compared to the 10 feet 3 inches of the Explorer. This makes it more comfortable for a tall person. The Challenger K2 is slightly heavier than the Explorer K2 but you won’t realize the extra weight. The Intex Challenger K2 has a bright green color which makes it look very sporty similar to the Intex Challenger K1. Like the Explorer, it is very easy to inflate and to transport. The sporty look makes it look much more expensive as compared to its price. When it is fully inflated it measures 30 by 15 by 138 inches. It can carry a load of 400-pounds. Best for: If you want a budget tandem kayak for a couple and both or either one of you are tall, the Intex Challenger K2 is a great tandem kayak for you. Most of the buyers online feel that it is an excellent purchase. It does not have major skid or control problems. It is made of high-quality material and is very durable. There were a few reviews about it having leaks but most of the reviewers who had this issue had kept the kayak in storage for a while. The kayak comes with a repair kit so a small leak shouldn’t be a major issue. It is best though to inflate it before you drive to the lake. You could also inflate it as soon as you get it so if you have any leaks, you can immediately ask for a replacement. As mentioned above Tandem Kayaks are best if you have a but of experience paddling kayaks beforehand because the learning curve of Tandem kayaks is a lot steeper and it requires more coordination with your partner. As a result they are not often the best vessel to start off with if you were looking for a pure tandem set up. Read this article for more information on how to paddle a tandem kayak. I think this is one of the most overlooked criteria of tandem kayaks because having a kayak that can only be configured in the 2 – 3 people range can really limit you. It is dependant on the other person actually going and as we know often times organising with other people can feel like your are trying to herd a bunch of cats. So if you are more stoked about kayaking than your partner then it is recommended that you choose a tandem that has a 1- 3 Person set up so you can have the choice of paddling by yourself, paddling with your kid or dog or even paddling with your partner and kid or dog. For recreational kayaks flexibility is what will be the difference between you using your kayaks and it sitting in the garage unused. Stability is the name of the game with tandem kayaks for beginners. Ideally you want to be paddling a kayak that you are comfortable with that does not feel tippy. I remember when I first tried a tandem kayak with a few of my friends we just couldn’t get it launched into the ocean without it being swamped with water. We were trying to figure it out and ended up finding out the problem, my friend sitting on a soccer ball in the middle of the kayak was causing uneven weight distribution and causing it to flip. The point of that story is to make sure that you are on the same page as the person you are paddling with and mind your balance. It is also important to find a tandem kayak that actually is built to be stable in the water and that it fits that environment. As a rule of thumb the flatter the hull is and the wider the kayak is, the more stable it will be. Sit on Top vs Sit Inside Kayak? For a Beginner I would highly recommend sit on top kayaks or kayaks that at least have easy exit and entry. Sit in Kayaks with two two cockpit holes will be a nightmare to right back up if you flip it and there is a very good possibility that it can get waterlogged in the process. For this you should be properly trained in how to flip your kayak back and re-entry. Sit inside Kayaks are far easier to flip back up and re-entry which makes them the more ideal crafts for beginners. They also have a lot more storage space available and are more versatile. The size of tandem kayaks is often dependant on A) How many people and how much gear you will be bringing and B) the Water conditions that you are paddling in. As a rule of thumb Longer kayaks track better but require more effort in terms of maneuverability while the opposite is true with shorter tandems. If you are planning on going for longer paddling journeys a longer tandem kayak is ideal, a shorter tandem is ideal for environments that require more maneuvering such as rivers. Something that you should also factor in is weight. Tandem kayaks are generally heavier kayaks which makes them harder to carry and transport to destinations. Keep this in mind when you are shopping for a tandem as this factor alone could be the difference between you using your kayak and not. If you are not confident in lifting and carrying these kayaks to the waterbed you can get kayak carts which you can simply push along like an oversized golf cart. #3. on this list is by far the easiest method of transportation as it does not require you to buy anything in support. Simply deflate and put it in the bag! Depending on the Tandem Inflatable Kayak you get some perform well in the water while others will be difficult to get any serious paddling in. The Advanced Elements would be a great tandem kayak to get for on water performance reasons but it is more expensive than either of the Intex models. The Roof Rack is probably the second easiest mode of transportation if you decide to get a hardshell kayak. There are lots of different kinds available so it is best to read into which one will be the best fit for your car or truck. I will say that you have to have a bit of muscle on you to do this as tandem kayaks can be a lot heavier than solo kayaks, make sure to look up proper lifting techniques. Getting a kayak trailer is also another option , be it the more expensive option mind you. You can read more about kayak trailer here. If your indoor/ outdoor storage options are virtually non existent like mine than you get an inflatable kayak, or find someone that will store your kayak that has the space. If you do have some space to spare you have some options. Thes best part with having some storage room is that you really don’t have to spend a lot of money on it. If you consider yourself more thrifty and a so it yourself type of person you can even build you own! Indoor Storage refers to anywhere that is inclosed like your garage as an example, there are lots of different ways to store your kayak in your garage that do not take up a lot of space . This is usually the best way to go as it insures your kayak lasts longer and you don’t find any critter surprises hiding out in your kayak outside. If you don’t have a big garage but have a yard outdoor storage it is! 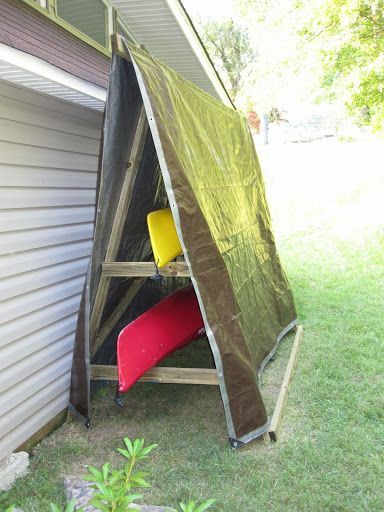 Just like Indoor storage you can be creative and build your own storage rack or buy one, just make sure that it is under an awning and that the kayak is fully wrapped with a tarp so that no critters can use it as a home for the winter. It is also important to keep you kayak out of the sun as the UV rays can do considerable damage to your kayak overtime weakening the material and allowing it it crack. Tandem Kayaks definitely have a bit of a steeper learning curve but if you are able to coordinate there are many benefits that you can get from them such as space, speed, stability and room available. The best best if you are a beginner is to get a vessel that has a 1- 3 person set up so that you are not just dependent on the other person to go kayaking.